Buckle your baby into this adorable car themed Dream On Me Ragtop 2 in 1 Walker and Rocker and watch the fun begin. Stock equipment includes 3 position height adjustments to grow with your baby, multi-functional toy tray with removable, musical toy car, a snack tray and removable & washable seat cover and foot matt. The multi directional wheels transition easily from floor to carpet, to make way for a walker that assists in your baby taking his first steps. Don't forget the tunes! It is musical and lights up to the delight of your baby. For added fun, it easily converts from walker to rocker with a gentle push and turn of the wheels. 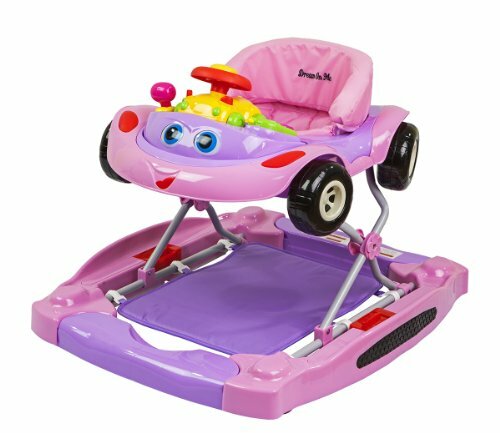 So whether your baby is buzzing through the halls in the Ragtop Walker or simply hanging out to the delight of the Ragtop Rocker, The Dream On Me Ragtop 2 in 1 Walker and Rocker fits the bill. If you have any questions about this product by Dream On Me, contact us by completing and submitting the form below. If you are looking for a specif part number, please include it with your message.